Each student received a commemorative yellow miner bag filled with giveaways to carry their lunch and everything they collected throughout the day. Schools were assigned to “towns” named after El Dorado, Dry Diggings, Coloma, Tahoe, and others. Each town housed six stations which may have included doll making, rope making, storytelling, blacksmithing, games, tin punching, survival, origami, Historical Museum tours, the Wells Fargo stagecoach, and much more. 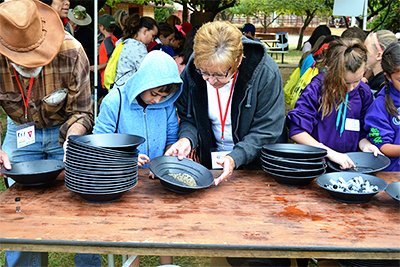 Each student was also given the opportunity to learn how to gold pan from the experts, and every Mini Miner went home with a gold pan and vial to keep the gold they found as a keepsake. During lunch, students, teachers, and chaperones gathered under a large white tent and participated in an interactive sing-a-long and play.